During WWII, Blue Star Banners indicated someone was serving. When the Soldier went missing, the star was changed to Bronze; when they were wounded it was silver, and gold if the Soldier was killed. The POPPY is a symbol of remembrance for those killed in combat. 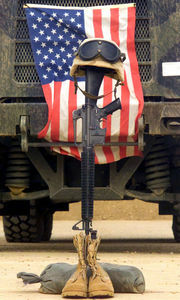 This is a testament of respect for our troops. The poppy should be worn as close to the heart as possible on the left lapel of the outermost garment. An old poppy should never be reused, and Poppies found lying on the ground should be placed in a cemetery or at the foot of a war monument.